Here’s one of those recipes that was altered from the original because for my family’s tastes, it was just too sour. 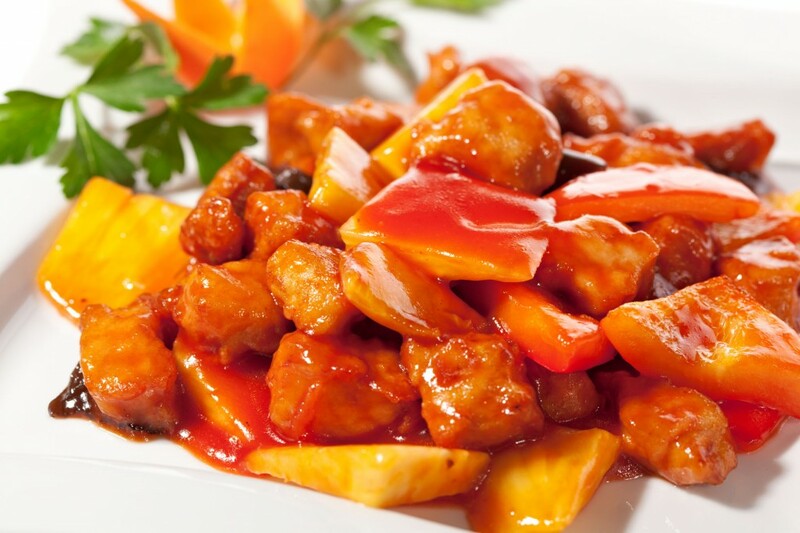 Of course if your tastes lean in that sour direction increase the amount of vinegar and decrease the sugar. It may have originally had some veggies in it too. That would be the ones that got picked out and left on the plate. It also tastes great with chicken instead of pork. In a skillet, brown the pork in the oil. Then add the corn syrup, vinegar, catsup, soy sauce, Worcestershire sauce, brown sugar, and pineapple chunks. Bring to a boil and simmer for 10 minutes. Mix the cornstarch with the cold water and add to the pan stirring constantly until mixture thickens about 2 minutes. Serve over prepared rice. Country house plans come in a variety of shapes and sizes, but most have a few common and recognizable features. Consider the features of these country home designs. 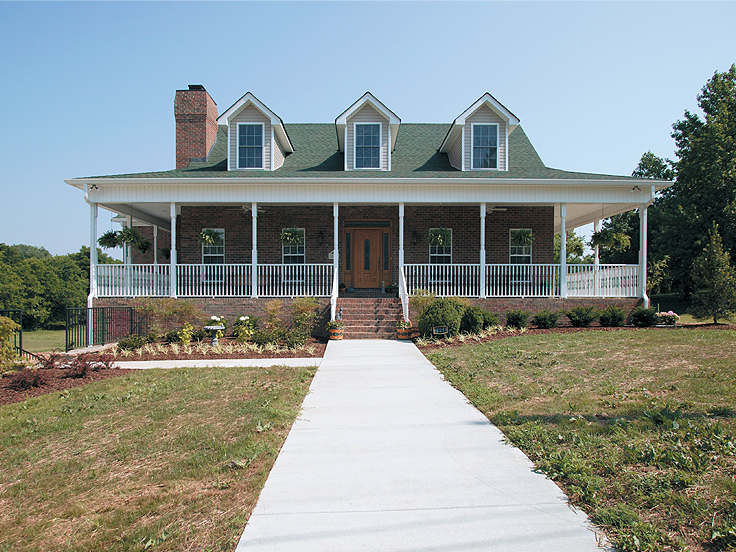 Covered porch with rail – One of the most easily recognizable features of a country house plan is a welcoming covered front porch lined with a decorative porch rail like the one that dresses up the exterior of plan 047H-0016. A covered porch offers a relaxing space for conversation, sipping lemonade with neighbors, and a peaceful place to sit in your rocker and watch the sun set. Metal roof – Nothing says country like a metal roof. Take a look at plan 063H-0208. 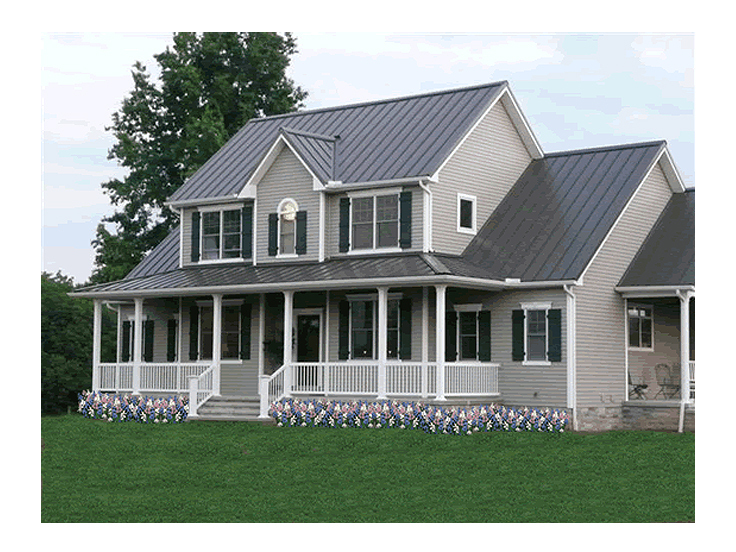 A metal roof takes you back in time, while giving your country home plenty of character and charm. Wrap-around porch – For those who enjoy outdoor living, a country-style wrap-around porch provides plenty of outdoor space to read, visit with friends and neighbors and watch the kids play in the yard. A wrap-round porch extends the living areas outdoors and gives everyone room to relax. Just imagine your very own porch swing! Check out the wrap-around porch on plan 054H-0010. 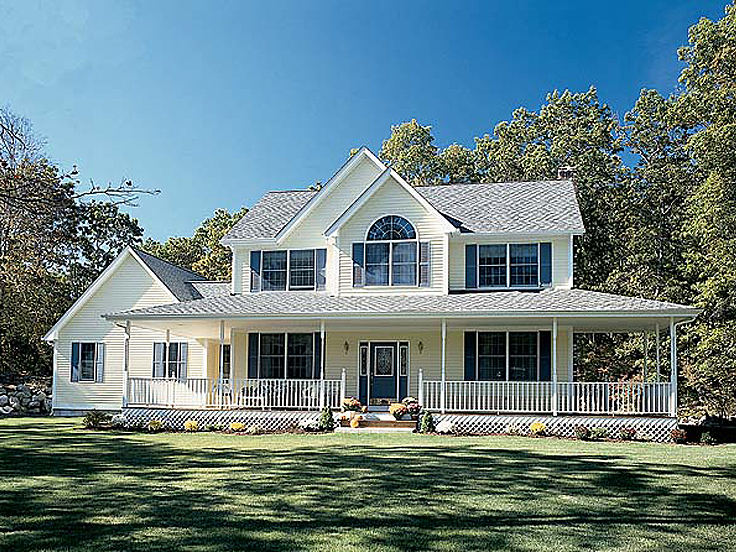 Roofline parallel to the road – Many country house plans feature a roofline that runs parallel to the road. Design 021H-0134 offers a perfect example. Country kitchen – Country home plans are known for their country kitchens or eat-in kitchens. When the dining space is situated within or adjoining to the kitchen, it easy to serve an entire family with little effort. Consider the step-saver layout of plan 006H-0074. Farmhouse style – Speaking of going back in time, some country home plans exude farmhouse styling. While reminiscent of yesteryear, farmhouses deliver modern floor plans with many of today’s most requested features. Consider farmhouse plan 059H-0039.